One of our all-time favorite quips came from Mark Twain, who noted that “while history does not repeat itself, it oftentimes rhymes”. With that particularly pithy caveat as a disclaimer, there are some strong and notably persistent tendencies in the capital markets that are unique to midterm election years, and which can create both challenges and opportunities for more tactically-minded investors. 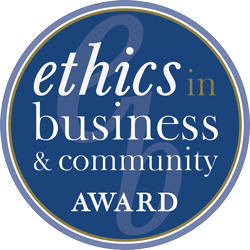 From our perspective, it seems reasonable to assume that these tendencies, and their influence on the capital markets, have the potential to be even more pronounced than usual in 2018, in light of a broad and far-reaching array of political issues, ranging from trade, immigration and tax policies to President Trump’s ability to determine the composition and balance of power on both the Supreme Court and the Federal Reserve, and even the possibility of impeachment. In addition, the November 6th elections will likely determine the fate of the so-called Tax Reform 2.0, which would include making permanent the recently passed individual tax cuts, President Trump’s proposed changes to mandated retirement plan distributions, and even the proposal being floated to index capital gains rates to inflation, which would be a huge boon for growth investors. We believe that the reason behind the unique characteristics and influence of midterm election years is self-evident. Specifically, there is a remarkably consistent tendency for the incumbent president’s party to lose substantial seats as a result of the election, which creates significant political uncertainty. Generally, investors hate uncertainly even more than they hate bad news, because they know how to price bad news, but they have no way of discounting uncertainty. Indeed, history illustrates that investors tend to react to uncertainty by pricing-in the worst-case-scenario, which normally creates buying opportunities, as the worst-case-scenario rarely comes to pass. 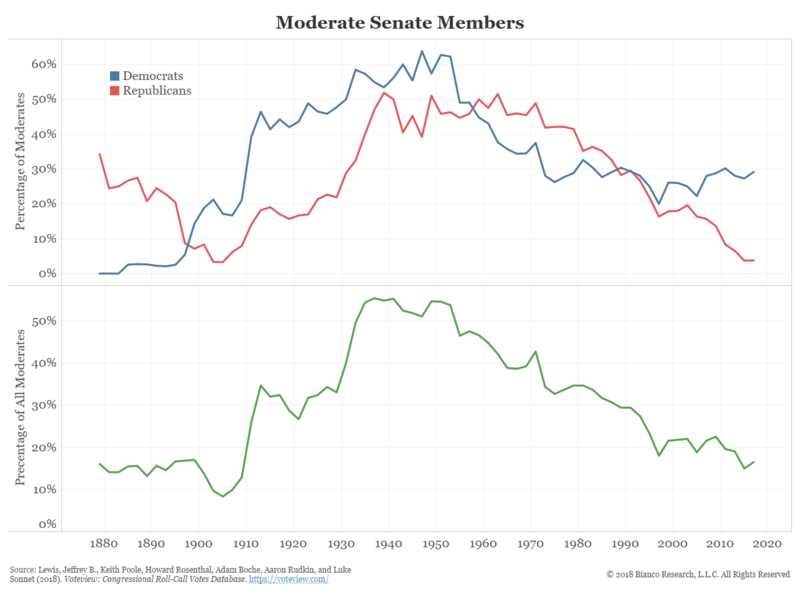 Over the course of the past 21 midterm elections, the incumbent president’s party has lost, on average, 30 seats in the House and 4 seats in the Senate. Moreover, midterm elections rarely surprise in favor of a sitting president, as evidenced by the fact that the president’s party has gained seats in both houses less than 10% of the time. 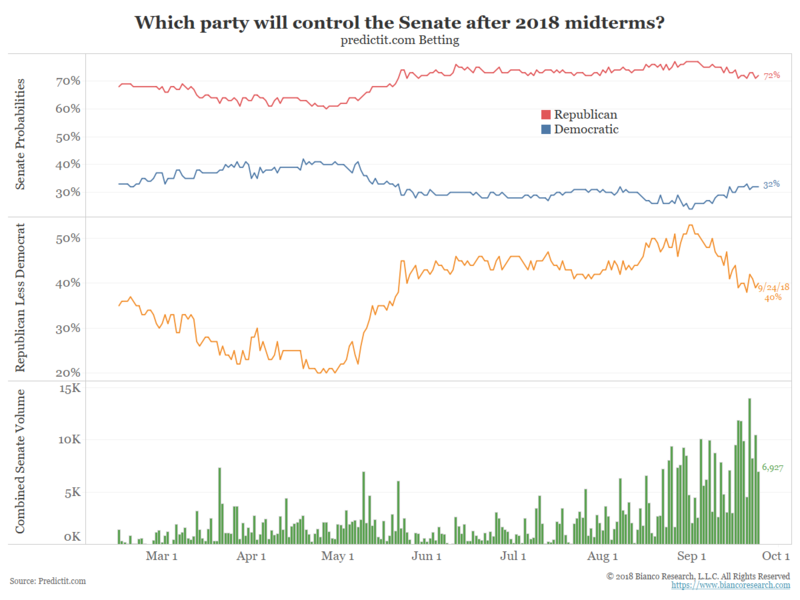 At present, the prediction markets, where speculators bet money on various outcomes, are predicting a 68% likelihood of a Democrat-controlled House and a 72% likelihood that the Republicans will maintain control of the Senate. Most political polls predict a similar outcome, although it is important to remember that both the polls and the prediction markets predicted that Great Britain would remain as part of the European Union and that Hillary Clinton would be the current president… Caveat emptor. There are 435 members of the House of Representatives, which means that Democrats must add 23 seats to reach the 218 seats required for a majority. Many political pundits expect for the Democrats to add between 28 and 40 seats. Republican control of the Senate is believed to be in considerably less doubt, as they only need to defend nine seats, as opposed to the 26 that the Democrats need to defend, ten of which are in states that Trump carried in the last presidential election. Of course, Wall Street has its own perspective, but most of it falls in line with polling and prediction market expectations. For example, Capital Alpha Partners assigns a 70% probability to a Democrat-controlled House, whereas the Wells Fargo Investment Institute assigns a 50/50 likelihood of divided government and only a 20% chance that the Democrats can recapture both houses. 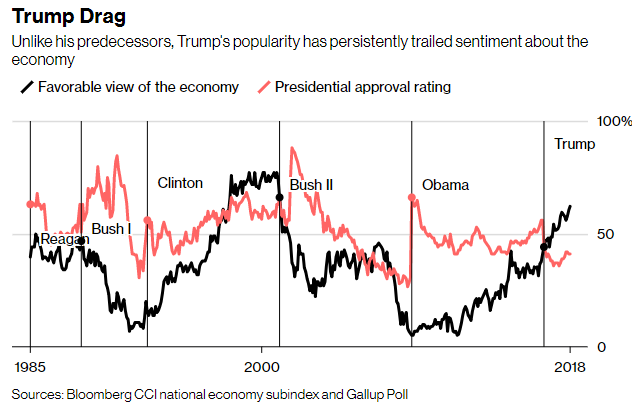 Ironically, in light of the current economic conditions, which feature full employment, a very strong economy, historic earnings growth and 18-year-high levels of consumer confidence, we suspect that President Trump could have avoided this historic midterm reversal of power, if he had just declared victory after his tax and regulatory reforms (even despite the various scandals). After all, history shows that voters almost always, as the old saying goes, “vote their pocketbooks”. 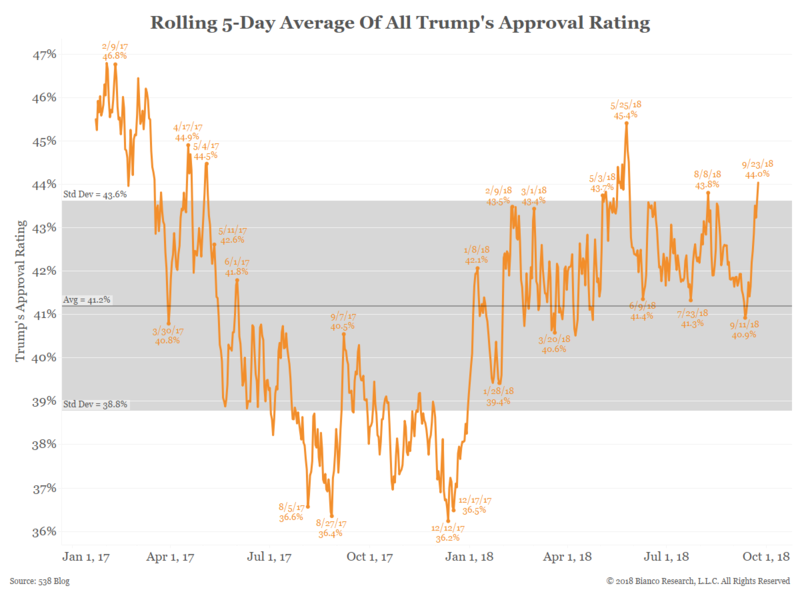 However, the President instead decided to pursue a variety of very controversial policies, including a very unpopular trade war (particularly that being waged against America’s traditional friends and allies), and very restrictive immigration policies that are exacerbating America’s significant labor shortage, and fanning the flames of wage inflation. 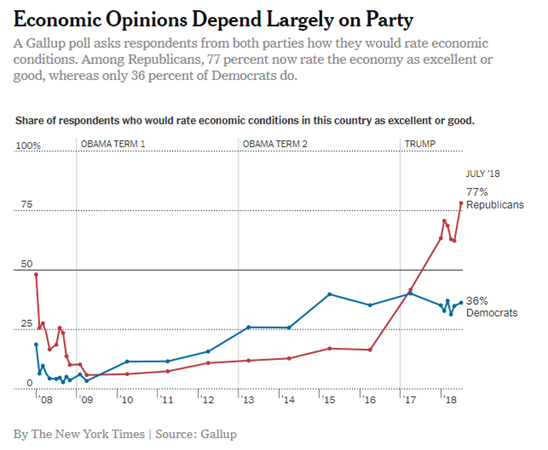 The result is that, instead of the President’s party being rewarded for a booming economy by grateful voters, President Trump, despite his impressive array of pro-growth policies, is the only President in the modern era whose approval rating is lagging measures of consumer and economic confidence. In short, his poor policies are keeping him from getting credit for the benefits of his good policies, and we would not be surprised to see that fact be reflected at the ballot box. It is noteworthy that the handling of the Brett Kavanaugh Supreme Court confirmation process is increasingly being viewed as a key element in the upcoming election, due to its potential to affect voter turnout. It is understandable why it might motivate women, in particular, to turn out and vote Democratic. However, there is a growing belief among political pundits that it also has the potential to energize what has been perceived as a lethargic Republican base, which believes that Judge Kavanaugh is being unfairly maligned by “dirty” Democrat political tactics. That said, the control of either house is reasonably attainable by either party, as is reflected in Nate Silver’s FiveThirtyEight analytical service, which polls voters on which party they support, without attaching any candidate names to the question. Their analysis is that it will require a minimum 6% to 7% lead in their polling for the Democrats to win control of the House of Representatives. As of the most recent September 21st polling data, the current Democratic lead is exactly 7%. Historically, such significant uncertainty has manifested itself in increased stock market volatility. That said, from a purely investment-related perspective, the election results themselves are likely to be only partially relevant, at least in the short term. To explain, as a general rule, markets only react to news if that news is a surprise. 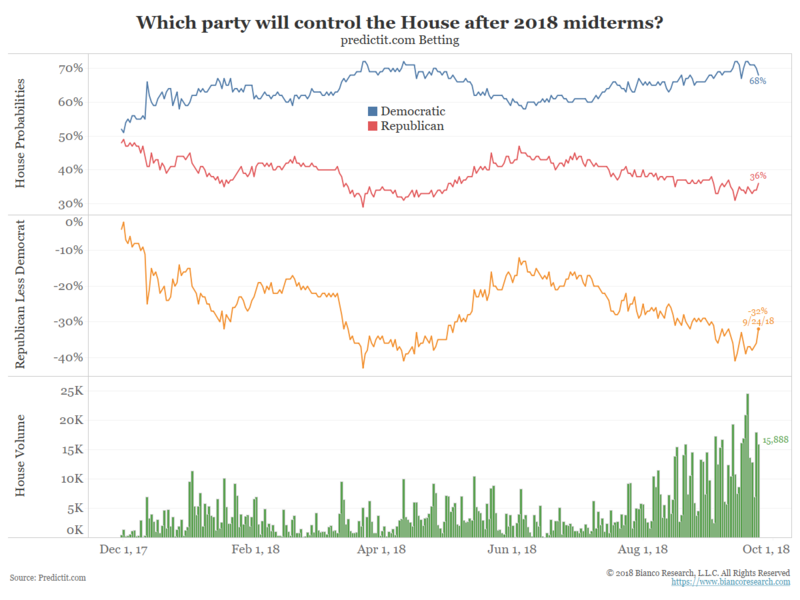 Any result that comes in as expected will have already been priced in by the markets, so it is reasonable to expect that the only result that would provoke a sizable market response would be one party coming away from the elections in control of both houses. In that instance, the reaction in the capital markets would likely be strongly positive if the Republicans maintained both houses, and strongly negative if the Democrats were to sweep both houses (particularly in light of the implications for a potential impeachment, which, to the dismay of growth-oriented investors, would introduce a whole new level of uncertainty). That said, we do tend to agree that divided government is the most likely outcome. Of note, while conventional wisdom has long maintained that investors prefer the checks and balances that result from divided government, research from Goldman Sachs shows that stocks in general, and smaller stocks in particular, tend to outperform during periods of united, single-party rule. According to their research, small stocks average annual gains of 9.5% during periods of divided government, which pales in comparison to the 31.8% gains made on average during periods of single-party-rule. The difference has historically been less significant for larger company stocks, like those represented in the Standard & Poor’s 500 Index, which has averaged 10.8% per year under divided government versus 16.4% per year under single-party rule. However, and perhaps even more to the point, the behavior of the capital markets generally and the equity markets in particular appears to be indifferent in regard to either the incumbent party or the election results, when it comes to midterm election years. Indeed, according to the Wells Fargo Investment Institute, the S&P 500 historically averages a decline of almost 19% during midterm-election years. This is based upon the past 14 midterm elections (going back to 1962) and, we believe, largely catalyzed by election-related uncertainty. This year has not been immune to this trend, as equity markets experienced their fastest ever 10% decline from an all-time high in January. 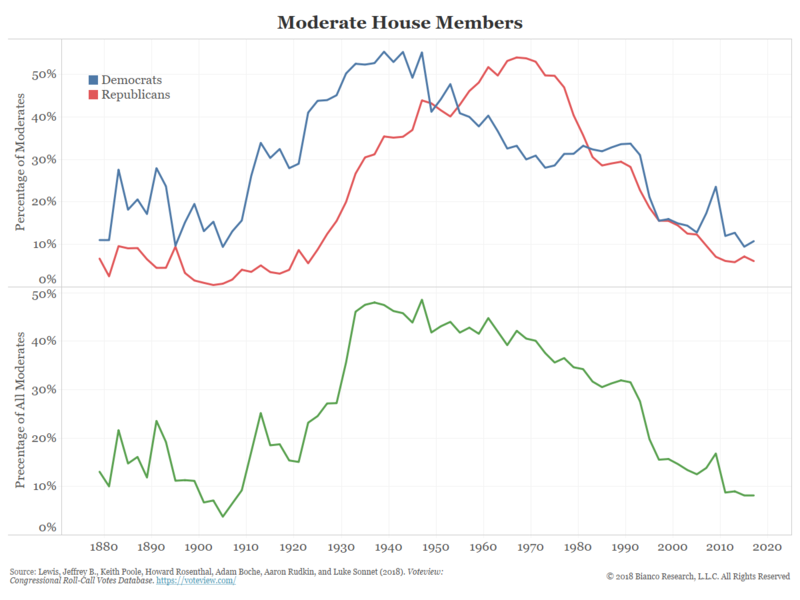 This pattern historically persists regardless of which party controls Congress either before or after the elections. As one would expect, just as an increase in uncertainty has historically catalyzed market declines, the removal of that uncertainty has historically catalyzed significant relief rallies. Indeed, in the twelve months following the midterm election, the Standard and Poor’s 500 Index has averaged gains of more than 31%, also historically without regard to election outcome, or which party was in control entering into the midterm vote. We would like to reinforce Twain’s perspective on history, and remind our readers that past performance is not necessarily indicative of future results. That said, there are also seasonal patterns that influence equity prices on a remarkably regular basis. One of those is that the most bullish part of the year for stock prices tends to run from late October to mid-April. You can see this reflected in the above chart, where the gold line illustrates the seasonally-bullish pattern that normally starts in late October of non-midterm election years. 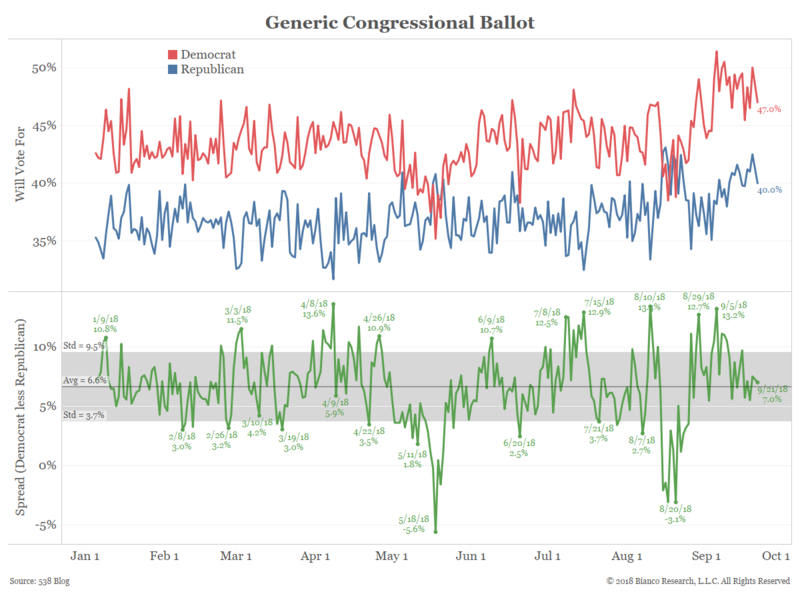 However, as you can see illustrated by the blue line, that tendency is even much more pronounced in midterm-election years. Indeed, you can see that the market tends to rally in early October, as investors gain more insight into what the ultimate election outcome will turn out to be, and then launch into an explosive rally as soon as election-related uncertainty fades away. 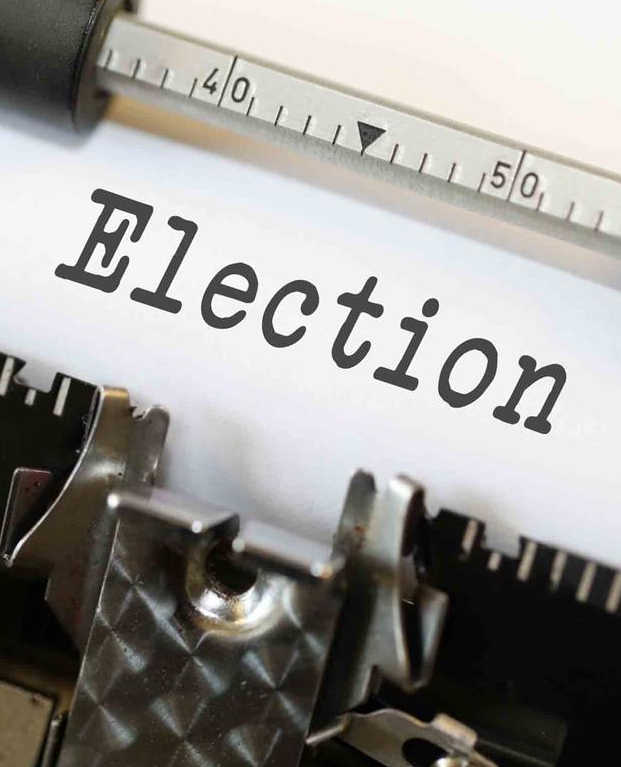 Research from UBS shows that the Standard & Poor’s 500 Index has rallied an average of 14.5% in midterm election years from the end of August to the end of March. Further, Deutsche Bank found that, in the three-month period ranging from one month before election day to two months after, the S&P 500 has produced a median average 8% gain, with only one decline in the past 21 midterm-election-years (a 4% drop in 1978). According to MarketWatch, during midterm election years, the S&P 500 averages a 1.4% decline between the end of August and the early part of October before launching into what has historically tended to be a very powerful rally that lasts into the spring. Their research also shows that the average midterm-election year gain totaled 14.5% from the end of August through the end of the following March. 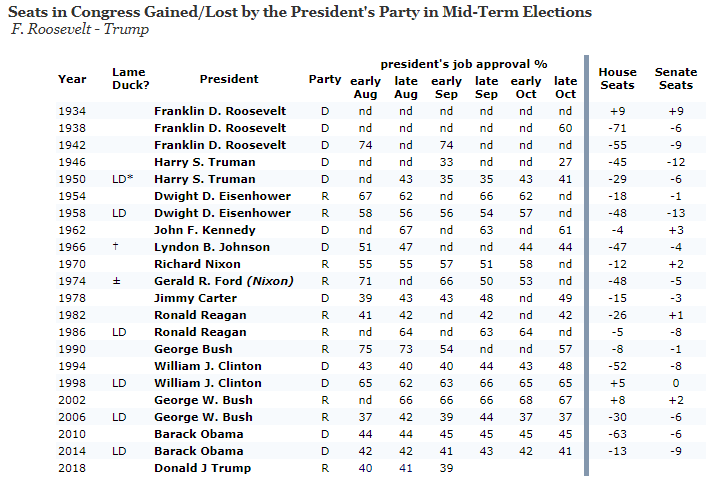 S&P Capital IQ analyzed the past 17 midterm election periods (starting in 1946) and found similar intermediate-term tendencies. 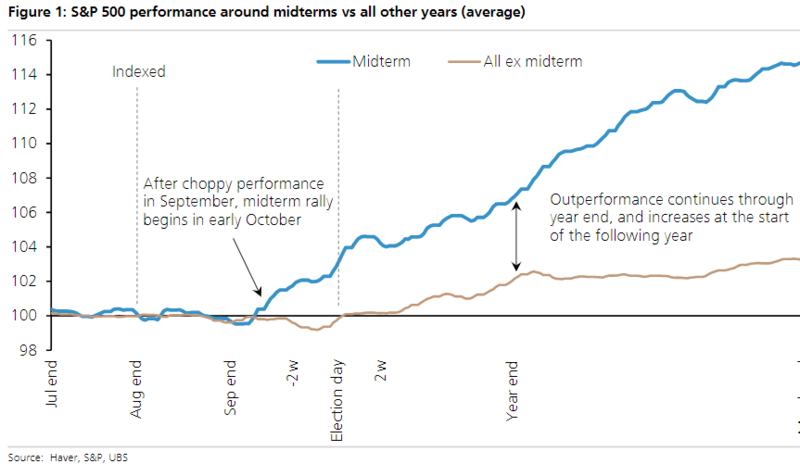 In fact, they report not only that the S&P 500 averaged returns of 17.5% in the 12 months starting from October of the midterm election year, but also that every such period posted positive equity returns. Our premise that markets decline prior to the midterm elections based upon an increase in political uncertainty and then rally in the post-election period, as the uncertainty is lifted, makes logical sense. However, it also poses the question of why it is that the relief rally tends to be so much larger than the uncertainty-driven decline. In our opinion, this lack of symmetry is due to the fact that midterm elections tend to bring the political environment back into balance, and remove many of the excesses that were created by the preceding election. This premise is based upon our observation (and the rational conclusion) that the biggest midterm power shifts take place in response to previous presidential elections producing an over-concentration of power in either party. There are several other important points that we would like to make about the upcoming election. First of all, we believe that a Democratic sweep of both houses of Congress would greatly increase the likelihood of an attempt to impeach President Trump (with its associated investor-related uncertainties). Second, a strong showing by Democrats may embolden President Trump to pursue even more protectionist trade policies, as trade protectionism is historically more of a Democratic platform than a Republican one. Finally, this election is taking place at a time of increasing political extremism, when moderates in both parties are becoming an endangered species, which suggests that this election may be even more impactful than normal. Each of these should be a point of concern for equity investors. Nonetheless, history teaches us that this is a very bullish part of the political cycle in which to invest in equities, and we are hopeful that history will once again “rhyme”. In the meantime, we believe that investors should be prepared for a potential uptick in equity market volatility.